Some people eat long noodles, other families eat blackeyed peas, but we have a pasta-making tradition on New Years Day. 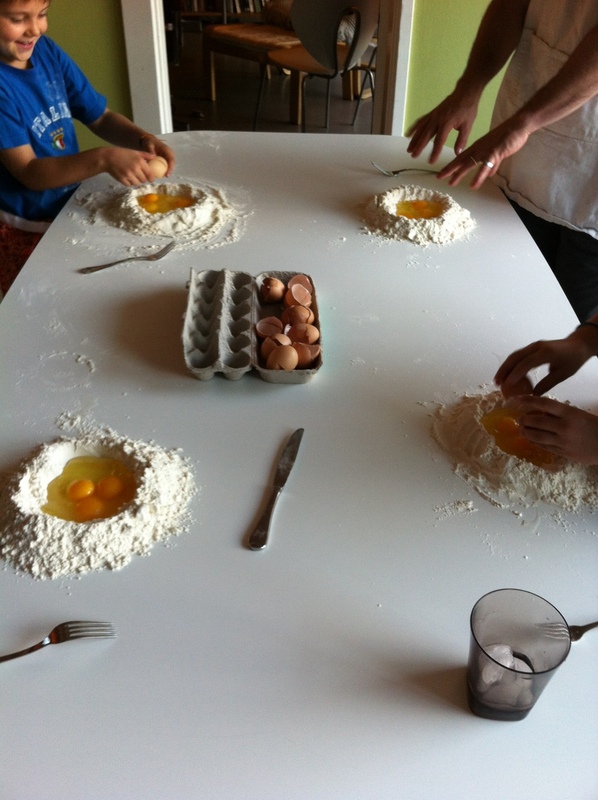 Actually, the tradition has been that I make the pasta and everyone else eats it. Mostly, I don’t mind. 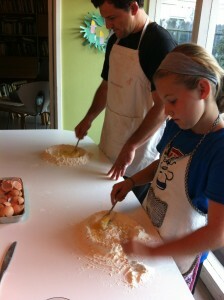 Mostly, I love making pasta the way other people love meditating, or running, or taking a nap. There are few other tasks in the kitchen that I find more therapeutic, and even fewer that have a better reward. But this year, I just didn’t want to make all that pasta only to have it disappear a few hours later, nor did I want to make the extra batches all by myself. 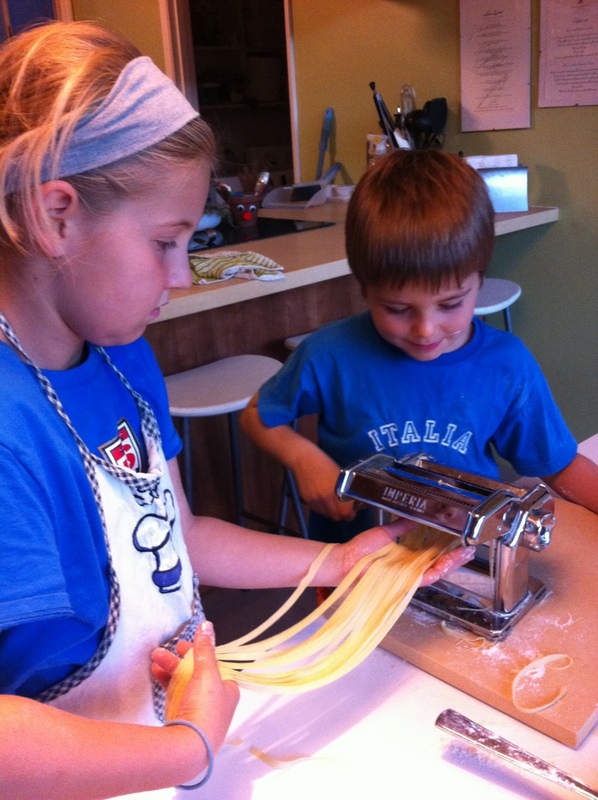 Plus, there’s no kitchen gadget my kids love more than the pasta roller. So I decided: It was about time the kids and Kory learned how to make pasta. 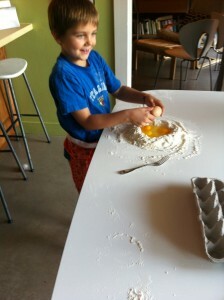 First, you clear the table and dump 2 1/4 cups “OO” type flour into a small hill at each work space. Next: you make a pit in the center of your flour mountain, volcano style. Crack 3 eggs into your crater. With a fork, puncture the yolks, then scrambled the eggs. Slowly incorporate the flour into the eggs. When the dough begins to comes together, you drop the fork and begin to knead, incorporating flour bit by bit until the dough is no longer sticky. Eventually, it will be smooth and elastic and will spring back when you poke it. 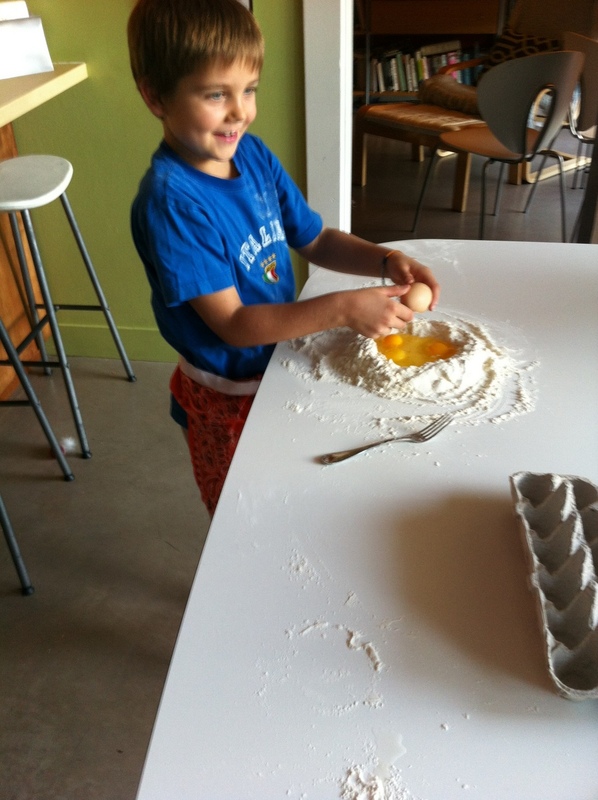 It’s messy teaching kids how to knead, so I couldn’t take pictures. But you’ll trust me when I say we ended up with 4 beautiful batches of pasta. 3 batches were packed away, unrolled and uncut in ziplock bags and stored in the freezer for another day. The last batch, we rolled into fettucine. Actually, Ella and Finn rolled it,with some help, then cut it on their own. Teamwork. We don’t have it every day, nor did we even have it all day on New Years Day, but we had it in this moment. This is one of my goals for this year: remembering that harmony, in small ways, matters.